In America when we have droughts, mid-tier hotels stop filling their pools. 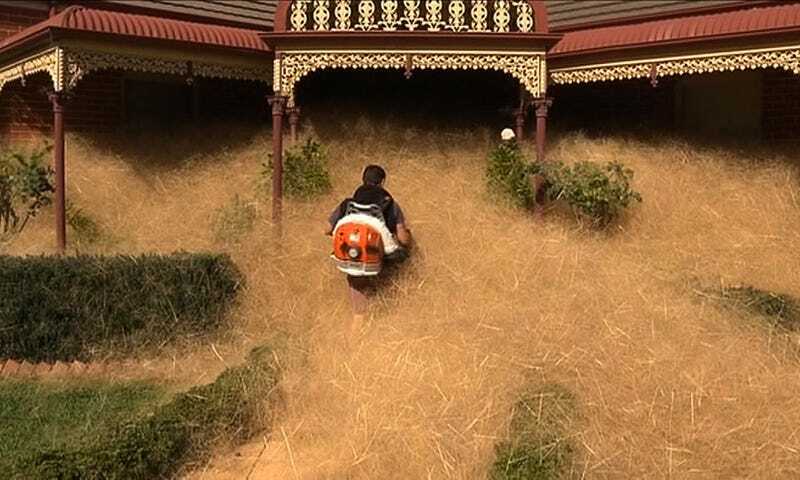 In Australia, you get “hairy panic.” That’s the wonderfully apt name for the fast-growing tumbleweed currently consuming the town of Wangaratta. To the residents of northeast Victoria, a little hairy panic every now and again is part of life. But this year, the weed has become an exceptional nuisance, piling up outside of homes and reaching roof height on several occasions, according to the Guardian. A city council spokesperson told Guardian Australia that authorities can’t do much about hairy panic “from an enforcement side of things,” so for the moment, we can only assume that hairy panic-stricken residents are fending for themselves with hazmat suits and leaf blowers. I have to say, I’m more than a little disappointed that the post apocalyptic Mad Max: Fury Road future didn’t feature towering piles of voracious tumbleweed and jaundiced mutated farm animals. But I guess there’s always room for a sequel.